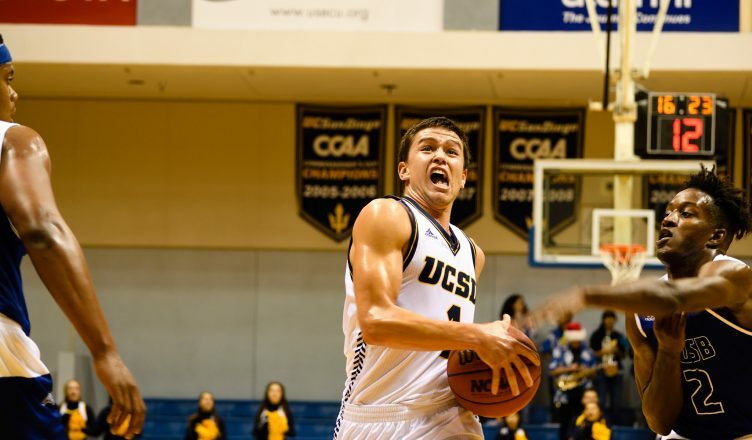 In its first California Collegiate Athletic Association conference game, the UC San Diego men’s basketball team rallied late in the fourth for a 77–71 victory. With this victory, the Tritons improve to 4–3 overall and start off strong in conference play. The Tritons started off the first half slowly, falling to a 0–9 deficit until junior guard Christian Bayne laid in a basket for the Tritons’ first points. The basket seemed to jump-start the Triton offense, as UCSD scored eight straight unanswered points following Bayne’s layup. The score changed hands multiple times from that point on, with neither team able to pull too far ahead. Going into the half, the score was in Cal State San Bernardino’s favor, 33–34. The second half began in a similar fashion to the first: UCSD started off slow and clawed its way out of a deficit. The Tritons found themselves down 10 points early in the half; however, they turned on the offensive pressure, closing the gap and securing a 56–55 lead courtesy of a Bayne’s three-pointer. With the game so close, the Tritons called on sophomore forward Scott Everman, who sank two triples from downtown to keep UCSD ahead. Undeterred, Cal State San Bernardino pressed the attack and kept the game close until the last minute of regulation. With the Coyotes at their heels, the Tritons dug deep and relied on clutch shooting by Bayne, who scored six points in the final two minutes. With the hard-fought victory under their belt, the Tritons looked next toward Cal State San Marcos.